Volume discounts work for insurance too. You’ve probably saved money at a grocery store or department store with volume discounts. Buy more of an item, and the cost per item goes down. Many times, you can get that same type of discount with insurance. If you keep your coverage separate, you could miss out on significant multi-policy, multi-vehicle and multi-driver discounts. Your savings could be upwards of 20 percent. We know of a couple that kept their auto insurance policies separate after they got married because they both liked their respective agents. When they purchased a home, they used the bank-recommended insurance company and thought nothing of it. More than 10 years later they decided to review their insurance and were amazed at the results. By bundling both of their cars and their homeowners insurance, they saved over $2,000 a year. Plus they increased the coverage amounts on their cars to match protection with their more upscale lifestyle. Take advantage of the savings. All too often, we acquire insurance on an as-needed basis. 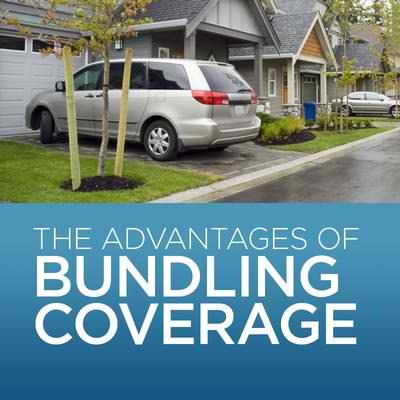 Think bundled coverage and you may save a bundle. Talk to your insurance agent about all your insurable assets – your home, autos, motorcycle, RV, boat – and see how you can get all the coverage you need as economically as possible.